The Best Marketing blogs from thousands of top Marketing blogs in our index using search and social metrics. Data will be refreshed once a week. Also check out Marketing Podcasts and Top Marketing Youtube Channels list for Top videos on Marketing. 2.101 UnMarketing | Stop Marketing. Start Engaging. Marketing newsletter is a comprehensive summary of the day's most important blog posts and news articles from the best Marketing websites on the web, and delivered to your email inbox each morning. To subscribe, simply provide us with your email address. Boston, Massachusetts About Blog Whether you're seeking industry trends, topical overviews or professional development, MarketingProfs is a blog for marketers of any ilk. Typically, umbrella sites don't deliver unique insights. But, as a network of marketers--supported and read by marketers--MarketingProfs is constantly stocked with legitimate content. Facebook fans 134,935. Twitter followers 437,881. We're Global! About Blog A marketing blog by Buffer with a focus on helping business owners and marketers understand and leverage social media to their benefit. Filled with well-researched guides and the latest social media changes, the Buffer blog aims to keep it’s audience well-informed and using the best marketing strategies. Facebook fans 107,735. Twitter followers 933,525. Everywhere About Blog Digital marketing and technology news covering Martech, Social, Search, Mobile, Display & Programmatic Advertising, Retail, Email, Video, Analytics CMO profiles, online marketing strategies, tactical content for marketers & more. Facebook fans 178,420. Twitter followers 192,779. Sydney, Australia About Blog Jeffbullas is a consulting, new media and web services company. This blog is about all things to do with Social Media and Online Marketing, including Twitter, Blogging, Facebook, YouTube, LinkedIn, Search Engine Optimisation (SEO) and and content marketing. The blog’s focus is to assist business in “getting found online” in a digital world and making your company visible and successful on a crowded web. Facebook fans 99,285. Twitter followers 559,011. Hoboken NJ About Blog In the Marketing Mentor podcast, Ilise Benun, founder of Marketing-Mentor.com, offers short but meaty conversational interviews with creative professionals who are doing what it takes to stop feast or famine, get better clients and command the fees they deserve – and sharing what they’ve learned. San Francisco, CA About Blog Brian’s blog is consistently named as a leading marketing and business blogs around the world. Brian Solis is a principal analyst at Altimeter Group, a Prophet company. He is also an award-winning author, prominent blogger/writer, and keynote speaker. Facebook fans 40,382. Twitter followers 285,005. San Mateo, CA About Blog Consumer and B2B marketing blog with tips & best practices on digital marketing, email marketing, marketing automation, lead generation, & marketing ROI. Facebook fans 175,513. Twitter followers 154,837. About Blog A place for marketing information and news. Facebook fans 1,210,795. Twitter followers 578,904. Everywhere! About Blog The Weebly Inspiration Center features experts from around the world sharing what they’ve learned about starting and growing big ideas. From web design and digital marketing to research on small business taxes and tips for managing your time and business psychology, the Inspiration Center was built to provide a resource for anyone building a business and doing what they love. Facebook fans 282,303. Twitter followers 123,981. US, Canada, EU About Blog GetResponse is the world's easiest email marketing platform, helping over 350,000 small businesses, marketers and brands get better results. At GetResponse, we help people create stunning email marketing campaigns with ease. Facebook fans 138,181. Twitter followers 64,084. San Francisco NYC About Blog VentureBeat is the leading source for news & perspective on tech innovation. We give context to help execs, entrepreneurs, & tech enthusiasts make smart decisions. Facebook fans 441,583. Twitter followers 718,527. Cambridge, MA About Blog The Wistia Blog is home to actionable video and marketing tips and the occasional over-the-top product announcement. Wistia aims to teach, delight, and inspire their readers to do something, whether that means making your first video with an iPhone or changing your video marketing strategy. Facebook fans 24,355. Twitter followers 32,377. Facebook fans 61,860. Twitter followers 286,984. Atlanta, GA About Blog Pardot is B2B Marketing Automation by Salesforce that allows marketing and sales teams to create, deploy, and manage online marketing campaigns that increase revenue and maximize efficiency. Their goal is to empower the Business to Business marketer. Facebook fans 34,140. Twitter followers 69,828. Mountain View, CA About Blog Learn techniques for marketing to improving your conversions, understanding your target market, and getting brand insights. Facebook fans 78,676. Twitter followers 40,936. Vancouver About Blog Unbounce lets marketers build, publish and test landing pages without IT or software. A/B testing and lead gen make it a powerful marketing tool. The Unbounce blog covers topics from A/B testing to social media including conversion optimization. Facebook fans 42,023. Twitter followers 79,747. Austin, TX About Blog Smart marketers predict the future, leveraging other people's marketing data and modeling the strategies of industry leaders and innovators. You too can now be up-to-date with market data and see trends before they sweep the industry! Facebook fans 338,925. Twitter followers 38,877. Vancouver, Canada About Blog The Wishpond blog delivers comprehensive guides on digital marketing. They write on everything from social media to email, lead generation, site optimization and marketing automation. They publish three to five times a week and pride themselves on long-form, complete walkthroughs for businesses of all sizes. Facebook fans 23,584. Twitter followers 25,764. UK, US and APAC About Blog The Drum is a leading provider of news, insights and live events for the global marketing industry. News for the marketing and media industries, with stories, job search resources, events listing, and features. Facebook fans 39,102. Twitter followers 209,579. About Blog Through Crazy Egg's heat map and scroll map reports you can get an understanding of how your visitors engage with your website so you can boost your conversion rates. Get hard-boiled conversion rate optimization advice from the experts at Crazy Egg. Facebook fans 10,580. Twitter followers 51,221. Waterloo, Ontario About Blog This is your one-stop destination to learn everything about video marketing. It provides information on how using video in sales can help teams be more efficient in qualifying leads, and prioritize hot prospects faster. Facebook fans 7,131. Twitter followers 11,971. TX About Blog In-depth growth & conversion optimization blog for advanced optimizers. At the head of ConversionXL is Peep Laja, a self-professed conversion optimization junkie. He is also the founder of Markitekt, a data-driven agency that helps ecommerce and SaaS companies grow. Facebook fans 8,537. Twitter followers 7,318. About Blog Wideo endeavours to provide a simple and intuitive tool that enables people without previous knowledge or training to create quality online videos. Facebook fans 11,539. Twitter followers 4,824. Walnut, CA About Blog Marketing Agency Software from ReportGarden gives marketing agencies a single, central solution to manage clients, campaigns & reporting on single platform. ReportGarden is a reporting tool for your adwords and other ppc accounts. It will help you quickly generate reports by loading your data on the fly. Facebook fans 2,865. Twitter followers 1,905. Clifton Park, NY About Blog Internet Marketing Ninjas offers the latest SEO Industry news, social Media Marketing notes, and chat.Our innovative methods and comprehensive, customized services make Internet Marketing Ninjas one of the most trusted Internet marketing companies in the world. Facebook fans 32,209. Twitter followers 14,114. Seattle About Blog Browse our Internet Marketing blog posts to learn more about our approach and techniques for improving a company's approach to digital marketing. Facebook fans 3,908. Twitter followers 4,951. NYC | LA | PHX | PDX | MIDWEST About Blog To be the most-trusted source of information about digital marketing in the United States. We are strategic advisors that work with world-class organizations to make digital marketing and customer experiences remarkable. Facebook fans 68,632. Twitter followers 41,478. About Blog CMO.com offers marketing insights, expertise, and strategies aimed at helping CMOs, senior marketers, and their teams deliver standout digital experiences. Facebook fans 36,037. Twitter followers 89,799. Facebook fans 1,734. Twitter followers 22,811. Facebook fans 867. Twitter followers 2,601. London, England About Blog B2B Marketing Magazine is a blog where the B2B marketing community comes together to share information, news, insights and knowledge of B2B marketing issues. Facebook fans 8,795. Twitter followers 106,303. Jacksonville Beach, Florida About Blog The famous Marketing Sherpa site publishes this well written & cross referenced blog on a range of internet marketing topics from email to search engine optimization. Facebook fans 9,063. Twitter followers 61,137. United States About Blog The Social Media Hat is an award-winning blog focused on helping businesses and marketers understand Content Marketing. Blog content, social media activity and email marketing are taught in ways that businesses can understand, enabling them to generate traffic, leads and sales for themselves. Facebook fans 7,538. Twitter followers 7,887. Facebook fans 18,713. Twitter followers 32,323. New York, NY About Blog Heidi Cohens Actionable Marketing Guide provides social media, content marketing, blogging, mobile, branding, PR and small business insights, tactics and tips based on Heidis corporate and small business marketing experience. Facebook fans 5,181. Twitter followers 34,638. New Jersey About Blog Demand Gen Report is an established publication for B2B marketing professionals and as such their content spans across a wide range of topics like marketing automation, content marketing, mobile & social trends, and lead scoring & nurturing. Facebook fans 792. Twitter followers 12,430. About Blog We are making the Web a better place by helping you to create beautiful, functional and stable websites that engage and convert. Facebook fans 118. Twitter followers 386. San Francisco About Blog Authored by industry experts, the Predictive Marketing blog by Radius offers insights on predictive, B2B marketing, and all things that drive revenue. Its mission is to help B2B marketers find, target, and understand their best prospects. Facebook fans 4,738. Twitter followers 13,024. Frankfurt am Main, Deutschland About Blog PPC's expertise in oil, gas and mineral transactions extends to complex title work, ARC GIS mapping, acquisition for drilling programs, gas storage, solar development, mitigation evaluation/support, and complex water matters. Facebook fans 4. Twitter followers 390. Facebook fans 26,973. Twitter followers 365. Redwood City, CA About Blog Blog post provides data and research on sales, marketing and high growth companies and it is a research and advisory firm that helps companies grow faster. They do this by shopping, bench-marking and improving the experiences that sales and marketing organizations deliver to buyers. Facebook fans 193. Twitter followers 1,973. Facebook fans 523. Twitter followers 1,589. United States of America-USA About Blog Ads2020.Marketing Blog for Free online Advertising, Social Media, Business Leads and sales. List of Classifieds, Apps, Tools, Directories, eCommerce Shopping Sites, Business Listing Sites. A collection of Sites for Online Marketing with Classifieds, SEO, Free Submission sites. Beginners Tips for Online Jobs, Home based Work. Facebook fans 1,123. Twitter followers 881. Richmond, Virginia About Blog Workshop Digital is a digital marketing firm in Richmond, VA that believes in accountable, measurable results achieved through custom digital marketing strategies created by real people. The blog is a contribution of all employee efforts, primarily focusing on industry trends while also highlighting cultural events and happenings internally. Facebook fans 389. Twitter followers 494. New Jersey About Blog Former IBM Distinguished Engineer Mike Moran’s blog on search and digital marketing. Facebook fans 194. Twitter followers 5,435. Facebook fans 581. Twitter followers 38. Glens Falls, NY About Blog Mannix Marketing is an award-winning digital marketing agency providing search engine optimization services, web design, inbound marketing strategies and regional marketing guides. Follow this blog to learn about our digital marketing services & find out how our SEO & web design company can help you grow your business online. Facebook fans 8,056. Twitter followers 7,703. Montréal, Canada About Blog As web marketing agency, our challenge is to create an original website that will set you above the search results and attract customers. Its mission is to support companies in their web projects, design and upgrade their websites to increase traffic and conversions, improving their positioning on Google. Facebook fans 1,946. Twitter followers 835. Minneapolis, MN About Blog A purpose driven marketing & growth firm that helps startups, social enterprises, and brands find traction & drive demand. Facebook fans 154. Twitter followers 254. Ridgefield, CT About Blog IMG Digital Inc is a Digital Marketing Agency Ridgefield, CT specializing in outsourced digital marketing services. We are a Platinum HubSpot Partner, Marketing Automation, Google AdWords Management, Social Media Management. Facebook fans 73. Twitter followers 2,390. El Paso, TX About Blog IM Roundup of the Best of Internet Marketing Articles, Blog Posts, Videos, Podcasts & More. It's a place for online marketers to share and learn out about the latest tactics, training, software, and more. Seattle, WA About Blog Lightboard is a design agency for sales and marketing teams. Join the hundreds of companies working with Lightboard. Our designers and account managers knock out stellar design for marketing managers at companies like Autodesk, Tile, and Toyota, and we'd love to help you. Facebook fans 5,611. Twitter followers 580. Chandigarh, India About Blog Bloghaul is a blogging platform where one can finds tips and tricks to master the art of Blogging, SEO Tips, Internet Marketing and Make Money Online. Facebook fans 914. Twitter followers 385. About Blog ZevaHit, an International digital marketing agency. We strongly believe that there's no merit in a 'one-size-fits-all' approach to SEO or SEM. Facebook fans 9. Twitter followers 29. About Blog We collaborate across the digital marketing industry to deliver marketing that works better for less to our small business, enterprise and agency members. Facebook fans 302. Twitter followers 423. Canton, Ohio About Blog Learn web marketing tips from Pole Position Marketing's team of expert strategists. SEO, PPC, Social, Content, Analytics, Link Building and more. Facebook fans 395. Twitter followers 959. About Blog Dave Kerpen has a growing passion for helping small businesses and is on a mission to transform small businesses into #LikeableBusinesses. Likeable Local’s Blog true purpose is to help provide education and guidance on power of social media and word of mouth marketing. Facebook fans 15,027. Twitter followers 9,472. 101. UnMarketing | Stop Marketing. Start Engaging. Toronto, Ontario, Canada About Blog UnMarketing is for those that believe business is built on relationships. Scott and Alison Stratten are co-authors of 4 best selling business books, co-owners of UnMarketing Inc and podcast. This site, the show and the books all represent their thoughts on the changing world of business through their experiences of entrepreneurship. Facebook fans 67,415. Twitter followers 181,883. Buenos Aires, Argentina About Blog Flimper creates intelligent robots to contact every user interested in having an experience with you. You can create specific audiences to optimize your ads on Twitter without the need to invest any minimum. Facebook fans 668. Twitter followers 2,210. California About Blog From Inbound Marketing and Web Design to Mobile Text Marketing and Email Marketing, we offer an array of products and services to effectively grow your business and your bottom line. Facebook fans 165. Twitter followers 639. Northern Ireland About Blog Growing a small business today can be tough, but there's a simpler option. Zymplify will help your business grow by turning strangers into digital audiences, and digital audiences into customers. We take the complexity and fragmentation out of Marketing Automation with our easy-to-use and straightforward platform. Facebook fans 1,745. Twitter followers 1,572. Greenville, South Carolina About Blog Engenius is a digital marketing agency based in Greenville, SC. We demystify digital marketing & web design with straightforward strategies: what you need and nothing you don't. Engenius is dedicated to great websites and measurable results for growing businesses. Facebook fans 1,422. Twitter followers 232. Pakistan About Blog Expert writing agency offering writing services (SEO articles, blog posts and copywriting) in diverse niches. Get powerful copy written by Smashing Writers. Get to know about the latest trends of Copywriting, Content writing and content marketing strategies from the blog of Smashing Writers. Facebook fans 3,686. Twitter followers 462. Facebook fans 547. Twitter followers 202. About Blog Learn how to start a profitable business, make money from your home and do what you love. Resources and tips to invest your money. Articles, guides, and advice on business creation, marketing, finance and other issues related to small and medium businesses. Facebook fans 34. Twitter followers 7. Seattle About Blog ReveNews is a trusted, unbiased source focusing on Internet related industries such as online marketing, SEM, affiliate marketing, retail (e-commerce), analytics, spyware, blogging and much more. Facebook fans 1,182. Twitter followers 2,776. About Blog Fun, sticky, creative marketing ideas by Jinal Shah. Facebook fans 115. Twitter followers 1,030. Westlake Village, CA About Blog Eric Sachs is an SEO expert who started his career in internet marketing over 10 years ago. After opening his own digital marketing agency, Sachs Marketing Group, he realized he wanted to use the industry know-how he had collected to help more people. From there, a blog was created with the goal to be of service to business owners, helping to better position them in the eyes of their audience. Facebook fans 1,662. Twitter followers 2,040. Tustin, CA About Blog Orange County, California based GMR Web Team offers full service website design, search engine marketing and website maintenance services for small to medium sized businesses. Our packages include a partnership option where GMR will take care of web design, marketing, and maintenance. Facebook fans 2,231. Twitter followers 1,830. Boston, MA About Blog We are a different kind of growth marketing company. We do not sell services like digital marketing, SEO, SMM, branding, web development, etc. We sell growth. When you hire a traditional marketing company, most of the benefits stop when the partnership ends. When you hire us, we will make sure that your business will be capable of sustainable growth even after we go our separate ways. Facebook fans 97. Twitter followers 1,745. Lagos, Nigeria About Blog We are one of the fastest growing Network on Google's Publisher Blog. Our aim is to provide exceptional Ideas, SEO and Blogging tips. Facebook fans 348. Twitter followers 5,965. Pune About Blog On a mission to make the world go minimal with ace designs, distinctive content, flawless codes and logical marketing. Facebook fans 3,745. Twitter followers 2,859. Los Angeles About Blog Clap Creative is your next door tech firm in Los Angeles offering full-range web services under one roof. An experience team of web professionals works to create custom internet solutions to meet your business goals. And when we say partners, we mean it! ere you can find ultimate Web related news, events , upcoming gadgets and Press Releases etc. Facebook fans 169. Twitter followers 4,826. About Blog We're passionate about digital innovation, smart ideas and the execution that brings it all together to create one beautiful experience. We offer comprehensive services to bring your project from start to finish. Boston via Watertown About Blog Web Design Boston Blog - digital agency blog for technical and marketing readers. We discuss design trends and new digital marketing strategies. Facebook fans 148. Twitter followers 900. Irvine, CA About Blog Digital Marketing is a set of online persuading values and tactics.These values and tactics when combine makes a business successful. Facebook fans 623. Twitter followers 3,717. Portsmouth, England About Blog Helen Cope marketing Portsmouth, Hampshire will help you establish and grow your online presence. I help companies throughout #Hampshire to grow revenue by implementing strategic #marketing campaigns which deliver fantastic results. Facebook fans 548. Twitter followers 1,979. San Francisco, USA About Blog The Insightly blog is dedicated to providing relevant, fresh, and easy to consume content for small business owners seeking to understand the benefits of using a CRM platform, and who want to better understand specific business growth strategies such as building out a sales pipeline, leveraging social media to build brand awareness and better connect with their customers. Facebook fans 35,148. Twitter followers 5,252. Philadelphia, PA About Blog ur open community of contributors covers breaking news and top trends in Social Media, Digital Marketing, Content Marketing, Social Selling and More. Our goal is to create an open community where professionals and businesses can connect with one another and the consumers of their products and services. Facebook fans 48,545. Twitter followers 81,922. Charlotte, NC About Blog TruRank Marketing is a search engine marketing agency dedicated to helping small to midsize businesses maximize online profit and increase brand awareness through SEO, social media, paid advertising, lead generation, and other online marketing efforts. Facebook fans 164. Twitter followers 876. Bucharest, Romania About Blog Human to Human Marketing. asile Stoica provides complete end-to-end marketing solutions to maximize your ROI. Facebook fans 1,833. Twitter followers 4,463. United States About Blog Lure Creative - an inbound marketing, website design agency in Kansas City. We're a Certified HubSpot Partner offering lead generation for growing businesses. Get the latest WordPress, Web Design, Social Media, PPC and Search Engine Optimization Tips & Suggestions from MarketingXchange. Get more leads! Facebook fans 347. Twitter followers 1,070. Dallas, Texas USA About Blog Bill has redone his site and blogs about a wide variety of topics ranging from the search marketing industry to linking to monetizing web site content. Facebook fans 3,818. Twitter followers 17,538. Duluth, Minnesota About Blog Marty Weintraub blogging about paid search marketing and organic SEO with the purpose of demystifying common topics that come up in his interactions with clients. Facebook fans 6,660. Twitter followers 16,778. San Diego, California About Blog Mari teaches and consults with businesses and brands to become a true social business, with measurable profits from integrating proven social media marketing strategies. After applying Mari’s methods, her clients typically achieve significant increases in traffic, subscribers, lead generation and conversion, client growth, affiliates, lucrative strategic alliances and targeted media attention. Facebook fans 206,837. Twitter followers 581,341. Chicago About Blog Public relations and marketing insights to help you navigate the changing media landscape. Including free media updates, best practices and trends. Facebook fans 231,758. Twitter followers 51,955. Facebook fans 50,077. Twitter followers 235,522. About - Moz develops inbound marketing software, provides robust APIs for link data and social influence, and hosts the web's most vibrant community of online marketers. Backed by the largest community of SEOs on the planet, Moz builds tools that make SEO, inbound marketing, link building, and content marketing easy. About - Whether you're seeking industry trends, topical overviews or professional development, MarketingProfs is a blog for marketers of any ilk. Typically, umbrella sites don't deliver unique insights. But, as a network of marketers--supported and read by marketers--MarketingProfs is constantly stocked with legitimate content. About - Learn the latest in online marketing tactics and strategy from leading industry experts. Every day there is something new and valuable to discover on the Kissmetrics blog.The KissMetrics marketing blog is full of great information about analytics, inbound marketing, and testing. About - Author of 17 books, inductee into the Direct Marketing Hall of Fame, and all-around customer experience guru, Godin’s foresight for what customers want out of digital is unparalleled. His internationally-acclaimed blog is a must-follow for anyone focused on putting customers at the heart of their mobile experience. About - Marketing Week is a leading UK magazine for marketing jobs, marketing news, opinion and information. Covering advertising, media, pr, online marketing & branding across all industries. About - The Marketing blog provides UK marketing and advertising news, opinion and feature commentary. Written by Will Corry, it provides insightful, informed no-holds-barred commentary on the state of advertising and media. About - John Chow rocketed onto the blogging scene when he showed the income power of blogging by taking his blog from making zero to over $40,000 per month in just two years. And he did it working only 2 hours a day. Today, John Chow dot Com is one of the biggest blogs on the Internet, with over 200,000 active daily readers and followers. About - Hello, and welcome! I'm Naomi. I turn smart, quirky people into smart, quirky entrepreneurs. Come play at IttyBiz - because better mindset + better marketing= magic. About - Web Analytics World (WAW) is recognised as being one of the world’s leading blog and news sites in its sector. WAW is not just a Blog, it’s a place where you can keep up to date with important internet and digital marketing issues, all explained in as friendly and jargon-free language as we can manage! About - The Wishpond blog delivers comprehensive guides on digital marketing. They write on everything from social media to email, lead generation, site optimization and marketing automation. They publish three to five times a week and pride themselves on long-form, complete walkthroughs for businesses of all sizes. About - Featuring the latest digital ad campaigns, hot new websites, interactive marketing ideas, virals, industry news, social media, insights, and other great digital trends from all over the world. About - Helping business and personal brands with digital marketing including social media with Blogs, Twitter, Facebook, LinkedIn, YouTube and Search Engine Optimization. Our goal "To optimize your brand in a digital world. About - Deepak Kanakaraju is a Digital Marketing Consultant from Bangalore, India. He is also an Author, Speaker and Trainer in the field of Digital Marketing. He blogs about digital marketing tips at this blog DigitalDeepak.com. About - Welcome to ShoutMeLoud blog. The best resource to start your online career. High quality resources to start making money online & grow your business. ShoutMeLoud is an award winning blog that talks about living a boss free life with blogging. We cover about WordPress, SEO, Make money Blogging, Affiliate marketing. 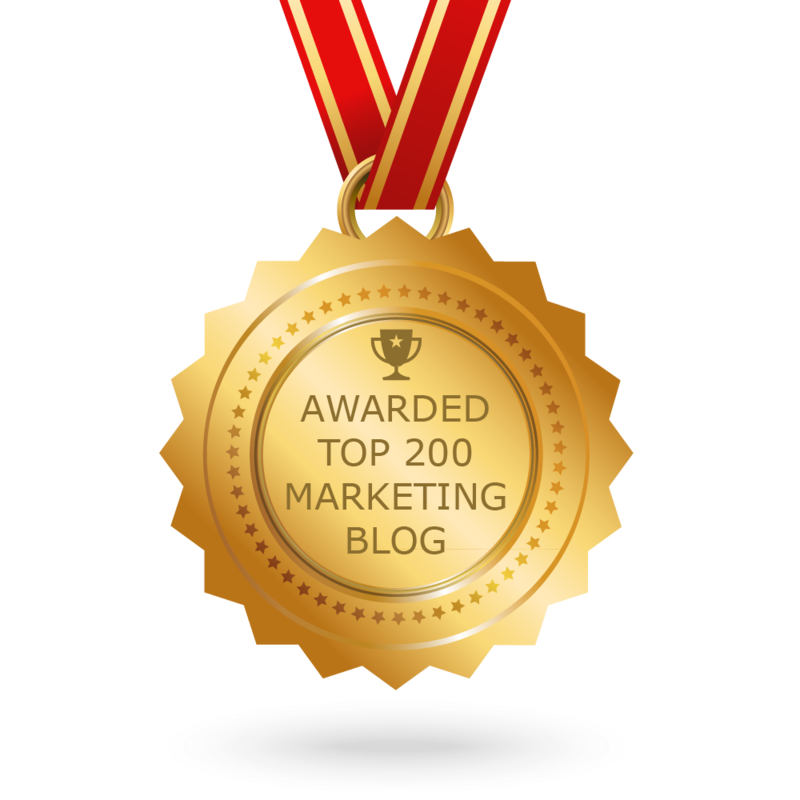 CONGRATULATIONS to every blogger that has made this Top Marketing Blogs list! This is the most comprehensive list of best Marketing blogs on the internet and I’m honoured to have you as part of this! I personally give you a high-five and want to thank you for your contribution to this world.